Fleas prove to be common problems for pet owners and a flea repellent alone can ensure complete remedy from flea problems. 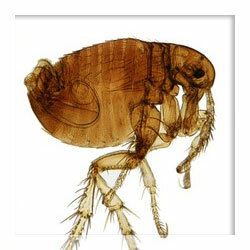 The word ‘Fleas’ encompasses a wide range of insects, mostly without wings. Nevertheless, these insects have long legs that help them cross and cover great distances. Make use of any flea repellent to provide relief to your pets from flea menace. Mix essential oils, cedarwood, and lavender and shake the mixture thoroughly. Spread this mixture over your pet’s skin. It will prove to be an excellent flea repellent. Cut lemon into quarters and put into boiling water. Allow mixture to stand overnight. This forms an effective flea repellent. Next morning, use this citrus repellent as a spray all over your pet, specifically around head, behind ears, armpits, and at base of the tail. Make a mixture of tea tree oil, lavender, eucalyptus oil, citronella, or geranium as a flea repellent and rub the mixture on your dog’s collar. You could also make a rope collar or a doggy bandanna. The aroma of these oils keeps away fleas. Include garlic in your pet’s diet. The smell of garlic emanates from the skin’s pores and proves to be an effective flea repellent. Natural apple cider vinegar makes your pet’s skin acidic and prevents presence of fleas or ticks. Brewer’s yeast tablets also help control fleas. Make a mixture of four parts of Borax with one part of salt to form a flea repellent and sprinkle it all over carpet and other areas. This combination dehydrates fleas and its eggs and disallows any re-hatching. Give your pet a bath with an effective flea repellent made of few drops of tea tree, herbal flea dip made from fresh rosemary leaf, or lavender essential oils. This repellent can provide immense relief to your pet from fleas. You can keep your home free of fleas by planting herbs and bushes that prove to be effective flea repellents. Plant Tansy herb around your pet’s enclosure to prevent any fleas. Alternatively, put cedar chips on your fence to keep away fleas. If fleas are causing extensive problems within the house, make use of a homemade flea repellent. Place a small pan of soapy water in the middle of a room at night. Also, place a small light or a candle near the pan. Fleas would be attracted towards the light and would end up in the soapy water. Next morning, flush off the soapy water. This is a very effective external flea repellent. Fleas require humidity for their survival. Dehumidifiers with air-conditioning and vacuuming interrupt flea life cycle and disrupt egg laying and hatching. Controlled environment can reduce flea presence extensively. This is an effective flea repellent. Additionally, it also gets rids of various other types of insects and makes your home safe. Use simple home sprinklers to spray Diatomaceous earth on furniture, around corners, on carpets, and other common hideouts of fleas. This flea repellent causes fleas to dehydrate and thereby kills them.